A vast majority of web traffic is filtered through search engines; Google, Bing, Yahoo, ect. More and more often, people start with a search engine query to find what they are looking for online. And yes, some of your website traffic will be generated from other sources like social media outlets but search engines are very unique in that they consistently deliver targeted traffic to your website. In other words, people who are specifically looking for what you are offering. If your site is not optimized for search than you are missing out on a lot of potential traffic. That traffic can equate to sales, exposure, and publicity. Google has managed to retain a staggeringly high percentage of the market share in search, over 90%. So for all intents and purposes, this e-course will focus predominantly on Google SEO standards and techniques though most of what you learn will apply to the other search engines as well. The graph below shows recent market share stats for search engines (Source : Business Insider 2018). Curious how search engines work. Here’s a brief rundown from Lifewire. Your SEO is like a credit score. This is how I like to describe SEO to Clients who know nothing about SEO, including what it stands for (Search Engine Optimization). In this scenario, your website is like you; trying to get the best score possible to achieve the highest buying power and preferential lending terms. Google, Bing and Yahoo are like the credit agencies. Think Experian, Equifax, etc. They are the governing bodies determining what your score will be and how to calculate it and then sharing that score with the appropriate third parties who are considering taking a financial risk on you. Like a credit score, your SEO is made up of a multitude of factors. Most of which we are aware of because the major search engines like Google have told us what these factors are. What we don’t know is exactly how much weight is given to each ranking factor. We have pretty good guesses based on testing across many reputable third parties but ultimately no one knows the exact value of each factor except for the search engines. This is not an exhaustive list but it covers the basics. If you’ve never heard of some, or most of these, that’s okay. I’ll explain some of them in more detail later on in this course. Keep in mind that just as some of these things can help your search ranking they can also hurt your ranking if not tended to. I’m sure you’ve heard a lot of catchy SEO jargon. Among the unique terminology used to describe the many facets of SEO, you’ll eventually (if you haven’t already) hear of ‘black hat’ and ‘white hat’ techniques. An SEO technique that may have been used successfully in the past may now be ‘black hat’ because Google’s algorithms have learned to recognize efforts to ‘cheat’ the system. Using black hat techniques can sometimes lead to a quick boost in rankings but will eventually lead to your site being penalized and in some cases, even banned from search results all together. Here are a few known black hat techniques. Doorway Pages - Pages that exist on your site only to hold a TON of your keywords and phrases. Never meant to be actually seen by a site visitor. Huge no-no. Keyword Cramming - Cramming as many keywords as possible into the body text of your website pages with little to no consideration for the person actually reading the material. Avoid repeating a keyword or phrase for the sake of having it in abundance. Linking Programs - Paid link placement on other sites, building fake pages just to link back to your original website (a link pyramid) or placing a load of random links on other pages linking back to a single page just to boost the page’s ranking will only serve to black list your site. Invisible Text - Think making some of the text on your page white will disguise it from visitors and web crawlers? Think again. Search bots can most definitely read that content, regardless of what color it is or how well camouflaged. White Hat Techniques are ways of improving a site’s ranking by using modern, approved methods as recommended by the major search engines such as Google. These are honest methods that are all in line with the ultimate unified goal of providing site visitors with the relevant data they are searching for. So what about the white hat techniques? Everything you learn in this e-course is considered white hat, ‘Google approved’ methods for improving your organic SEO. In addition to what you’ll learn in this Fundamentals Course, follow up e-courses will provide you with more in-depth, lesser known SEO techniques to help gain an advantage over your competition. Google rankings can be very competitive depending on your industry and desired keywords. For example, a wedding photographer in New York City trying to get to page one of Google under the phrase ‘best wedding photographers in New York’ is going to be met with some very tough competition because they are in a saturated market. All hope is not lost though as there are many advanced SEO techniques and tactics that can be employed to get a competitive edge in competitive SEO environments. Foundational SEO like what you are learning in this course is the necessary first step to building a bigger and better strategy. Sometimes foundational SEO is all that’s needed to get high rankings but in most cases you’ll need to build on that foundation with more advanced techniques. But let’s not run before we walk. There are a ton of mistruths on the Internet on any given subject. And SEO is no different. In fact, sometimes it’s even harder to separate fact from fiction in the world of SEO because it is so quickly evolving. What was a fact last year could likely be fiction this year. Below are a few of the most common misconceptions I have come across while working with SEO newbies. Fiction : SEO is dead. Fact : SEO is very much alive. It simply has to evolve with each new technological advance in the online search arena. Fiction : Squarespace has awful SEO. Fact : Squarespace is a CMS for building and managing websites, not an SEO consultant. That said they recognize the important of good SEO and have many built-in features that guide you toward better SEO but ultimately it’s down to the user to implement and maintain their SEO. I wrote a whole blog post on this topic if you’d like to read more. Fiction : If I set up my SEO I will rank on page 1 of Google. And, when I do rank on page one, my site will always stay on page one. Fact : So wrong. SEO is an ongoing endeavor that constantly evolves and should be nurtured and incorporated in to your overall long term marketing plan for the best results. In the following section, I’ll be providing you with short term AND long term SEO tasks to help keep you on the right track well after you’ve completed this course. Fiction : SEO is a huge myth to make money. Fact : Many reputable sources have proven time and time again that good SEO leads to increased revenue…for your business, not some evil empire. By now you’re probably realizing (I hope!) that SEO is complex study that most folks don’t have time to keep up with on top of holding down a full time job in something else. That’s why geeks like me are handy. I have a passion for this stuff. I enjoy keeping up to date on the most recent developments, technological advancements in search, and how they apply to the websites we have invested so much money in building. You have a full year of access to this course and you can bet I’ll be updating the materials periodically to ensure you’re always getting the most current information available. Can be successful doing your own SEO? Yes, you can. Obviously, otherwise why would you be here right?! Most people can easily understand the basics of SEO, as outlined in this course. Even those foundational SEO basics will make a difference for your site. SEO can, however, get more advanced and complex. And that’s when most businesses should turn to a professional. It all comes down to your time and willingness to learn it and keep up to date with it. Here’s what some of my fellow ‘SEO geeks’ have to say about the current state of SEO. Low bounce rate is associated with higher Google rankings. We want to rank content that is useful for them (Google Search users) and if your content is really useful for them, then we want to rank it. Sadly, much of the content being published is simply not worth linking to. 75% of it is getting zero inbound links. So forget the ‘more is better’ approach to content if you want links. Go with quality instead. Your content will generate links only if it is truly exceptional—’remarkable,’ as Seth Godin would say. No website can stand without a strong backbone. And that backbone is technical SEO. Build for users, not search engines. Quite possibly one of the most important take-aways I want you to have from this e-course is that you should build your site for the user, not the search engines. In today’s SEO if you’re building for the user you will indeed be optimizing well in the eyes of the search engines. Yes, the search engine is King in the world of SEO, but really, it’s the users who drive the decisions and ultimately the factors that determine how your site is ranked. Search engines like Google know this, and so do the algorithms that analyze and rank your site. Every decision you make regarding your website should be lead with ‘how does this affect the user’. User being your target audience. Those users typically fall into one of three ‘buckets’ if you will. The DO-ers : These are users who are looking to make a purchase or transaction of some sort. For example, buy a plane ticket or set of headphones. 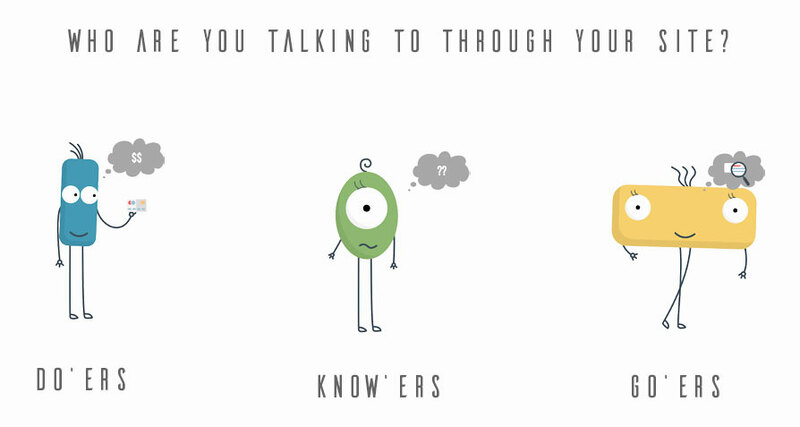 The KNOW-ers : Users who are looking for information. For example, what are the best hotels in Atlanta or what is the best fizzy water drink. The GO-ers : Users who are trying to navigate to a specific place online. For example, Apple’s homepage or Twitter. Knowing this about the ocean of users online, you have to then ask yourself if the users who land on your website will be satisfied with what they find. Will the information you provided them with answer their query? Hint : the answer should always be yes! With that being said it’s time to move on to implementing SEO on your website.